Ok, so by now you shouldn’t have too many “leftover” leftovers…as in, stuff you cooked on Thanksgiving. We hope you’ve checked out our recipes so far, made some or have just frozen your stash for late in the winter when you are too weary from shoveling snow to cook. Then you can just pop your leftovers in the oven and have dinner in under an hour! Today’s offering seeks to use up my “other” leftover supply. Things I overbought, thinking I’d use them for Thanksgiving, but I didn’t. Such is the case with corn. I always buy too much of the stuff. In general, my household isn’t a big corn eating household. We do like cornbread on occasion (especially with my Turkey/TVP chili), but otherwise, we usually just eat it in the summertime, on the cob, when we’re grilling out. At any rate, I switched up my momma’s recipe a bit. Hers starts with rendering a LOT of bacon fat, so you can see why I might have wanted to make a few swaps. I do believe, however, I did her dish justice. 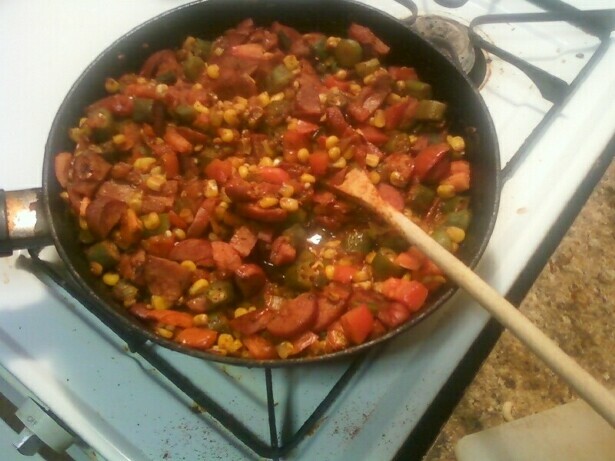 Optional: (if you like spicy food, like me) 1/2 – 1 tsp Cayenne pepper (depending on your heat tolerance. If you like things just a little kicky, go more toward 1/4 tsp). In a sprayed pan, cook the smoked sausage until you it is a bit blackened on both sides. Add onions and garlic and cook until thoroughly caramelized (they’ll be brownish-yellow in color and very soft). 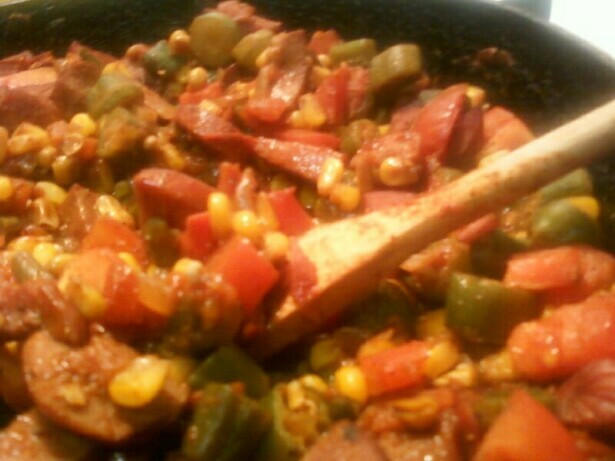 Add the corn and the tomatoes (juice and all) and allow them to thaw out before finally adding the frozen okra. The okra should go in DEAD LAST. See, the thing about okra is that the more you handle it, the more likely you are to get the characteristic okra “goo.” If you throw it in at the end and just stir it occasionally, I PROMISE there will be no goo! If you are using zucchini, add it at this stage also to ensure it doesn’t get too soft on you. Bring it to a boil and then reduce to a simmer and then add your chili powder and cayenne if you choose to use it. Note to my spicy food lovers: don’t use more than a tsp. Trust me on this one. All these ingredients absorb spices REALLY well. Simmer for about another 10 minutes or so and you’re ready to serve! This will be my lunch today. It’s warm, comforting and a great way to use up corn without taking the express bus to carb town!